There were quite a few complaints about the Windows Phone's ListBox scrolling performance in the past. The Windows Phone team obviously heard it and heavily worked on the performance and responsiveness of the whole platform and the ListBox in particular. The touch input processing was loaded off from the UI thread to a new separate thread. Additionally the BitmapImage doesn't load the data on the UI thread anymore. I'm sure lots of other tweaks were implemented to increase the performance and the responsiveness of the platform. I think the Windows Phone team did a very good job! The video below shows a side-by-side comparison of a Nodo device with build 7392 and a prototype device with a Mango prebuild. The Nodo device on the left side is a Samsung Omnia 7, the Mango device on the right side is the ASUS prototype. For comparison I use the official Twitter app build against 7.0 and in the second half of the video I show the effects preview list of my Pictures Lab app. This effects pivot item only uses a ListBox with a DataTemplate that contains an Image control with a fixed size and a TextBox for each item. So there's no background image loading being performed or any other heavy computing, just a static list with a lot of redrawing. As you can see, it's quite a huge difference and even this Mango prebuild runs very smooth on this rather old ASUS hardware. There's still some room left for more improvement, like the rasterizer, but imagine the boost on production devices with the final Mango version. I don't have a deal with Microsoft or are paid to blog or tweet this. I'm just exited about all the goodies that are coming with Mango. Good times. If you read this blog regularly, you might have noticed a lot of SLARToolkit posts recently. But I'm not the only one using the open source Silverlight Augmented Reality Toolkit. There's great stuff happening out there and I see quite a few projects, especially in the academic field. You can find a full list of projects (I know of) on the SLARToolkit project site at CodePlex. I love when people use my open source work, adapt or learn from it. This is what open source is all about for me. One project recently caught my attention in particular. Ioulian Alexeev made a very amazing action game using the Unity 3D game engine and he combined it with SLARToolkit to control the spaceship with a marker. Ioulian studies Multimedia at the Arteveldehogeschool in Belgium and the game "StarFighter" was his bachelors test. He recorded this nice video. Both toolkits use the same marker-based AR algorithms from the ARToolkit. You can play the game here. If you want to try it yourself you need do download the SLAR and / or L marker, print them and point the camera toward these. The marker(s) should be printed non-scaled at the original size (80 x 80 mm) and centered for a small white border. As an alternative it's also possible to open a marker file on a different device and to use the device's screen as marker. See the SLARToolkit Markers documentation for more details. The release of the new Mango tools brings Windows Phone development on par with Silverlight 4 and will therefore add many great features to the Windows Phone platform. This means it will also contain the Webcam CaptureSource and VideoSink API from Silverlight 4. Additionally it also introduces the new FileSink class which can be used to record the video stream as MP4 to the Isolated Storage. Most important a new PhotoCamera class with a lot of functionality is present in Mango. 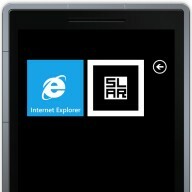 This class is used in the latest SLARToolkit Windows Phone sample and in some other new projects I'm working on. The Silverlight 4 webcam API was explained in this detailed blog post almost a year ago. The techniques and concepts I described there can now also be used with Windows Phone Mango. 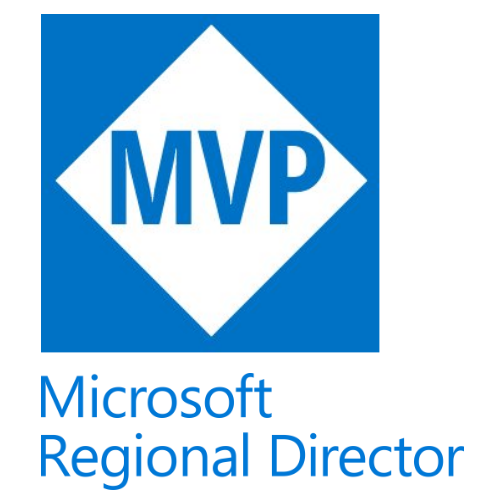 The updated MSDN documentation has quite a few articles and samples about the new camera API. My MVP buddy Alex Golesh also has a nice write up about the new Camera API. This blog post tries to fill the gaps and provides some information especially about the PhotoCamera's YCrCb capture methods. In the well-known RGB color space the red, green and blue information is stored in separate components which also contains the redundant luminance data for each channel.  In the YCbCr color space (or YCrCb) the luminance information is stored in the Y component and the chroma (color) information in the Cb component as blue-difference and in Cr component as red-difference. The RGB-YCbCr conversion can be done with simple addition and multiplication operations. The Y component usually ranges from 0 to 1, Cb and Cr from -0.5 to 0.5. Humans are more sensitive to luminance information than to chroma, therefore the resolution of the color information can be reduced and only the luminance needs to be stored in full resolution. Many digital camera sensors use the YCrCb color space and make use of this reduced chroma information. The PhotoCamera class has a lot of useful methods to either capture a full resolution image from the camera or to get a smaller (and faster) preview buffer snapshot. The GetPreviewBufferY and GetPreviewBufferYCrCb methods provide the direct data from the camera without a transformation to 32 bit ARGB. Not only is the alpha channel left out in the YCrCb buffer, also the Cr and Cb color components are stored with reduced resolution. This keeps the buffer size smaller and is way faster, but also makes it a bit trickier when the color components (and brightness) need to be extracted from the byte buffer. Fortunately there's the YCbCrPixelLayout property which contains alls the offsets, strides and other needed information. The GetPreviewBufferYCrCb method is approximately 4 times faster than the GetPreviewBufferArgb32 method and also takes a smaller buffer, therefore the YCrCb methods are the way to go when only the luminance data is needed or the YCbCr color space can be used for the given scenario. For example many computer vision techniques only need the luminance information for processing. I like that both color spaces are supported by the API. On mobile devices you need all the performance you can get. I actually helped the Windows Phone camera team with quite a bit feedback to decide about this API design. Very smart people by the way. 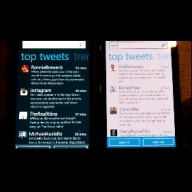 The beta of the new Windows Phone Developer Tools was just publicly released. The update with the codename "Mango" comes with many new APIs and will finally contain an API for real-time camera access what a lot of developers have been asking for. The new runtime gives us the needed functionality to implement many cool scenarios. One of these scenarios is Augmented Reality, which leads to my open source Silverlight Augmented Reality Toolkit (SLARToolkit). This post announces the new Windows Phone version of SLARToolkit and also provides a sample. If you're one of those lucky people with a Mango-enabled device you can download the XAP here or just watch a video instead. 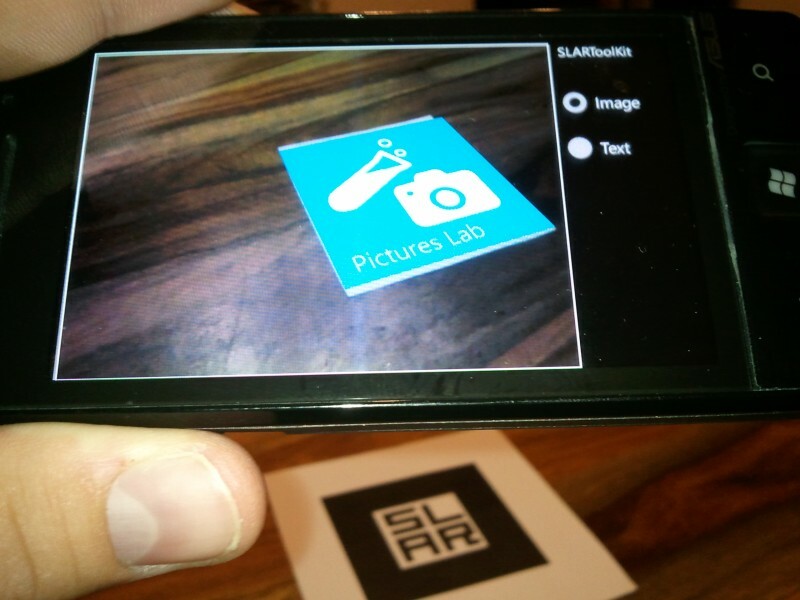 SLARToolkit is a flexible marker-based Augmented Reality library for Silverlight and Windows Phone with the aim to make real time Augmented Reality applications with Silverlight as easy and fast as possible. It can be used with Silverlight's Webcam API or with any other CaptureSource, WriteableBitmap or with the Windows Phone's PhotoCamera. SLARTookit is based on the established NyARToolkit and ARToolkit. The sample XAP can be deployed to a Mango-enabled device (tested with build 7629). Alternatively there's also a video of the new sample embedded below. If you want to try it yourself you need do download the SLAR and / or L marker, print them and point the camera toward these. The marker(s) should be printed non-scaled at the original size (80 x 80 mm) and centered for a small white border. As an alternative it's also possible to open a marker file on a different device and to use the device's screen as marker. I've recorded a short video of the new sample with my Samsung Omnia 7. It's a bit blurry, but it demonstrates how well the sample works even on this quite old ASUS prototype, which's camera pipeline seems a bit slow. The video is also available at YouTube. 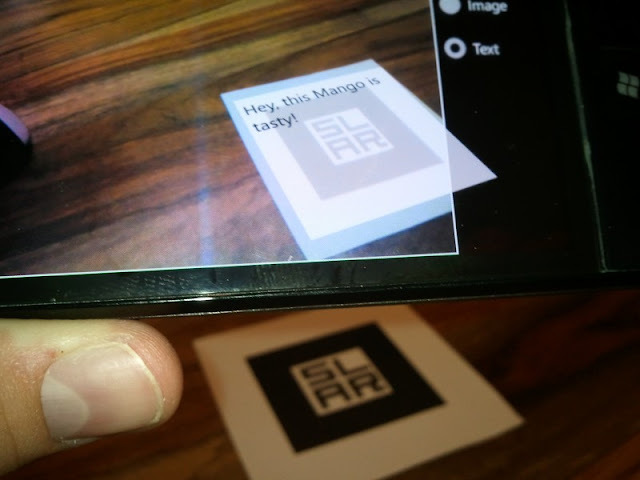 This demo shows how the new Windows Phone Mango real-time camera API can be used to augment the reality with the help of the SLARToolkit. This can be nice for educational projects and it's actually no problem to add correctly transformed videos or other content to the demo. The demo demonstrates just some basic UIElements like a TextBox and an Image control. 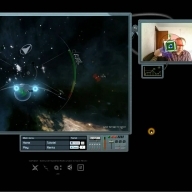 Mango will also enable the combination of Silverlight and XNA, which means that nice 3D AR games can be developed with the help of the SLARToolkit. This sample uses the new PhotoCamera and a timer to constantly get a snapshot of the real-time camera stream. This snapshot is then passed to the SLARToolkit algorithms to get the 3D spatial information of the marker. The computed detection results are used to transform the elements perspectively correct. The PhotoCamera instance is set up in the OnNavigatedTo event handler of the page and the DispatcherTimer is started. The timer will constantly call the Detect method every 50 milliseconds. Additionally a viewfinder Rectangle is filled with a VideoBrush which in turn has the photoCamera video stream set as source. A snapshot of the current preview buffer is taken in the Detect method using the GetPreviewBufferY method. This method fills up a byte buffer with the luminance data of the current viewfinder frame. This buffer is then passed to the SLARToolkit's MarkerDetector Detect method, which returns the detected marker information. This transformation data is then used to transform the UIElement perspectively correct in 3D. Read more about the PhotoCamera's YCbCr methods in this blog post. The SLARToolkit's GrayBufferMarkerDetector is created and set up in the PhotoCamera's Initialized event handler. The brand new GrayBufferMarkerDetector uses the byte buffer with luminance data directly without the need of an ARGB 32 bit pixel conversion. Checkout the source code at CodePlex if you want to see all the details of the sample which were left out for clarity. The open source SLARToolkit library and all samples are hosted at CodePlex. If you have any comments, questions or suggestions don't hesitate and write a comment, use the Issue Tracker on the CodePlex site or contact me via any other media. Have fun with the library and please keep me updated if you use it anywhere so I can put a link on the project site.